organization that has enhanced the quality of life in the community by enriching learning and community outcomes through reciprocal partnerships with Slippery Rock University. You were nominated as a result of my recent campus-wide call for nominations and recommended to me by a review committee comprised of SRU students, staff, faculty, and community partners. Your selection for this recognition is based on the achievement of community outcomes through engagement with SRU social work students throughout the entire course of their education. 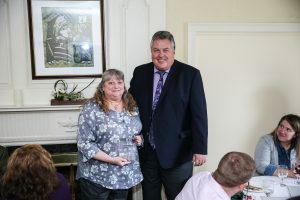 Honorees of our SRU President’s Awards for Civic Engagement will be recognized and the nature and results of the exemplary work celebrated at a special awards luncheon to be held at the President’s House at Slippery Rock University on Monday, April 9 at 11:30 AM. Award winners will receive a plaque of recognition and the NHSC’s profile will be posted on the SRU website.